As you may have noticed, I usually get a bit long penned writing my blog posts, and this could certainly be one of those. But with there being so much we were able to do here in DC, I am going to just try and hit the highlights. We were able to enjoy 8 days here and I think that was just perfect. Our days were full and long, but so worth it! Our RV Park, Cherry Hill Campground was the perfect base camp from which to explore and close to a Metro Station, which we used a lot. Easy to figure out, safe and fairly clean, but more expensive than we thought. Certainly there is always more to see and do, but we feel like we hit the big items that were on our list. Let me start with the things we did not get to. The Washington Monument just re-opened after being repaired from an earthquake a couple years ago. Thus, if we did not have an advanced ticket or get in line at 6:00AM to get a daily ticket, we weren’t able to go up in the monument, so that one we just were able to view from the outside. Still massively impressive in its size and so iconic, it was surreal to be standing outside of that monument. The other venue we could not get into that we wanted was the White House tour. This is one you have to request through your Senator 4-6 months in advance, and we obviously did not do that. But, we did get Capitol Tour tickets through Patty Murray’s office, with two interns leading the way, allowing us to get access to some areas that most people do not see. I would have to say the highlight of this was sitting in the House of Representatives balcony at the opening of a session and standing with the reps and gallery for an opening Pledge of Allegiance and prayer, pretty cool. Also sitting in the Senate listening to Senators from TX, LA and CA strongly discuss environmental issues. Our first couple days we spent touring the Mall area, basically the heart of DC from the Capitol building stretching past the Washington Monument down to the Lincoln Memorial and over to the Jefferson Memorial. Lining the Mall area are many of the Smithsonian Museums (all free! ), with other gardens and lesser recognizable structures. The Mall is a huge grassy area that is used by everyone for relaxing and taking in all the sights, and grabbing a beverage or snack from one of the dozens of food truck vendors. 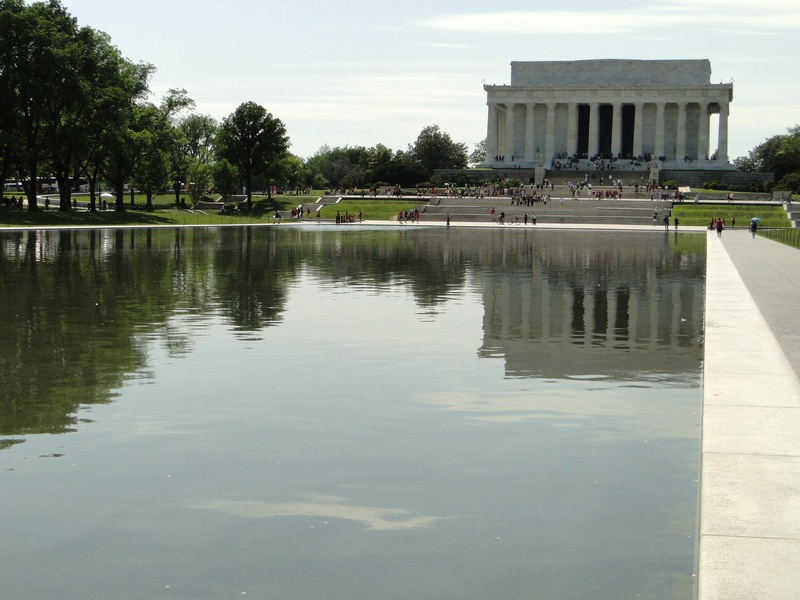 It is almost two miles long from end to end, so there is a ton of walking, and most of DC is very pedestrian friendly. We did A LOT of walking, between 5 and 9 miles everyday (according to Traci’s fitbit). 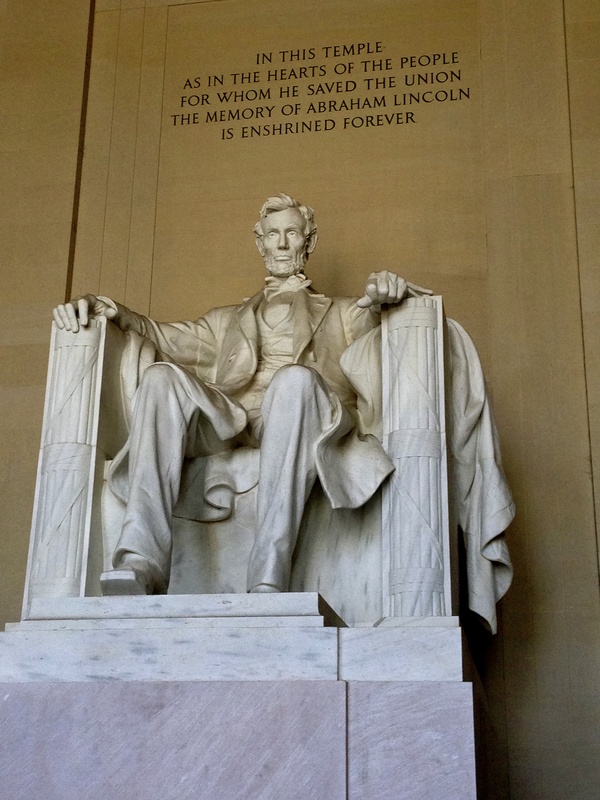 Lincoln Memorial – awesome to stand at the base of him sitting in the chair we have all seen so many times. 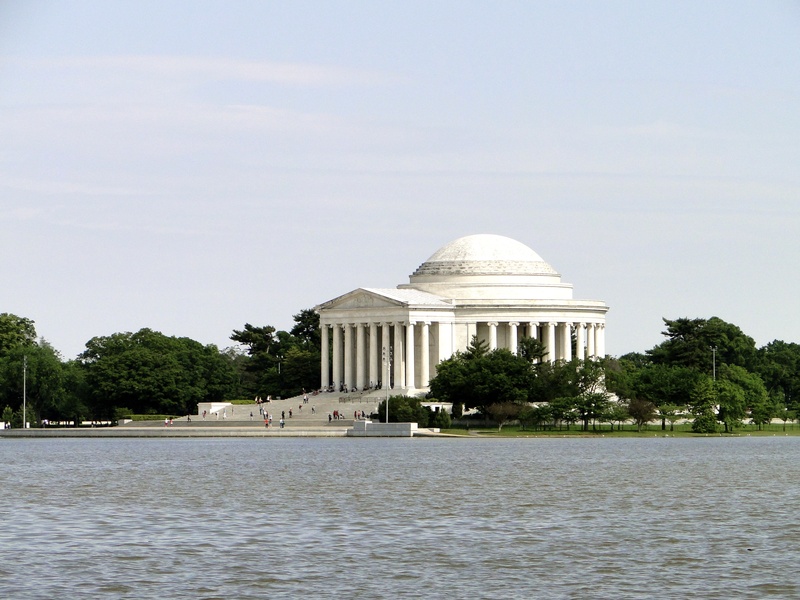 Jefferson Memorial – not as impressive, we thought the view was better from across the Tidal Basin to look back at the structure. National Air and Space Museum – Many iconic flying vehicles, one of my favorites. Museum of American History – So many items to see; Dorothy’s slippers from the Wizard of Oz, Julia Child’s kitchen, the original star-spangled banner, etc. This was Traci’s favorite. 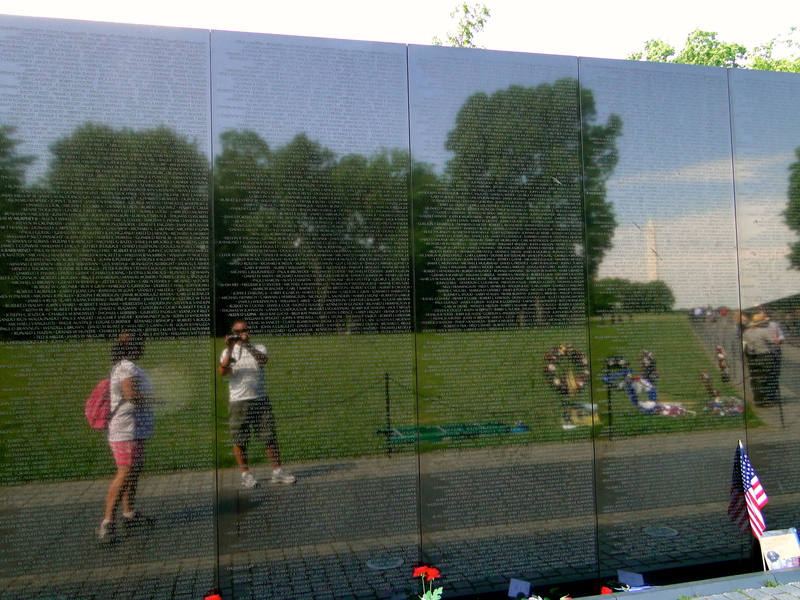 Vietnam Veteran’s Memorial – super powerful here with many people laying flowers and other gifts, and taking a piece of paper and tracing a name of a loved one or friend listed on the wall. 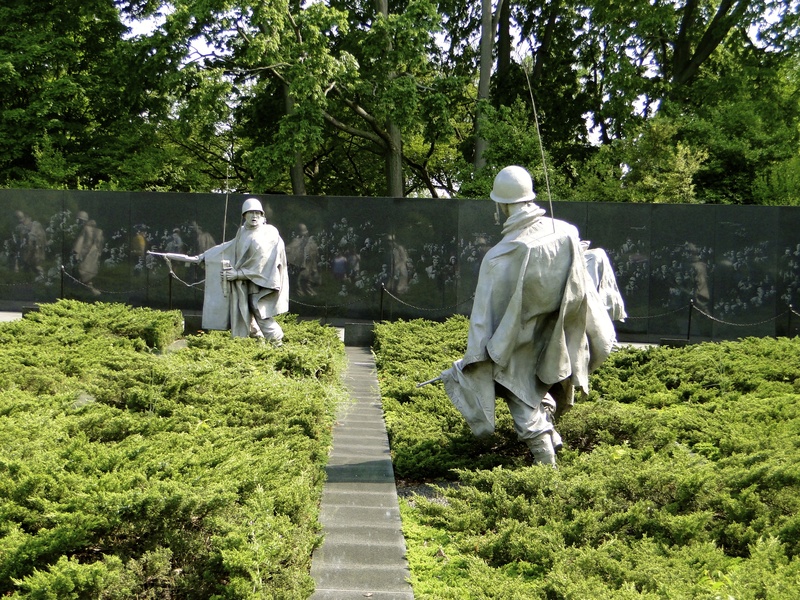 Korean War Memorial – awesome display of troops walking through the rice fields. Museum of Natural History – this one was so packed with school groups that we didn’t stay as long as we would have liked. Great exhibits on mammals, bones and gems (the 45 ½ caret Hope Diamond). National Archives Museum – the Bill of Rights, Declaration of Independence and Constitution are housed here. Other Memorials we visited in the Mall area were World War II, MLK, FDR and the Navy. During our visit, we were lucky to be in town for a few other events as it was Memorial Day week. 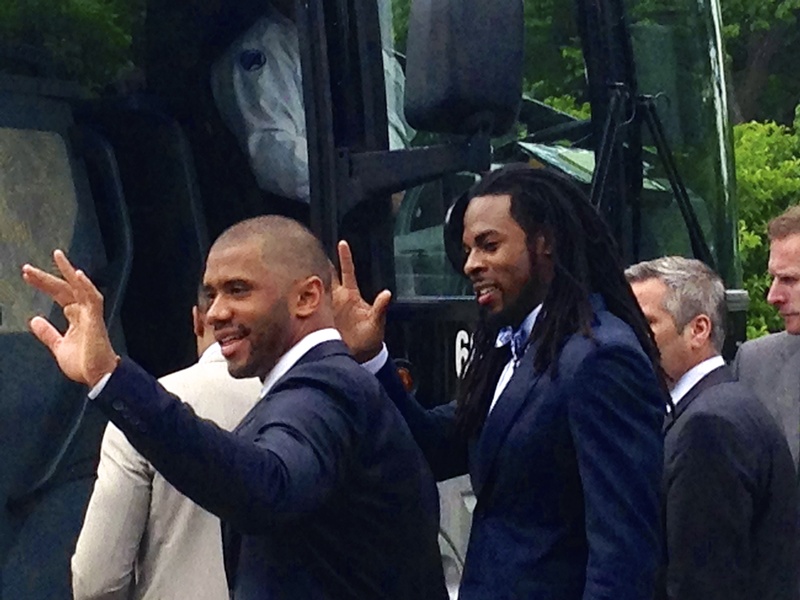 First was the official visit to the White House by our Super Bowl Champion Seattle Seahawks! We found their buses on the backside of the White House and stood outside with about 75 other fans hoping for a glimpse of the players before they got on the buses to leave (we missed them arriving). After waiting around for almost two hours, they finally emerged and many were very gracious in signing autographs and engaging a bit with the group. 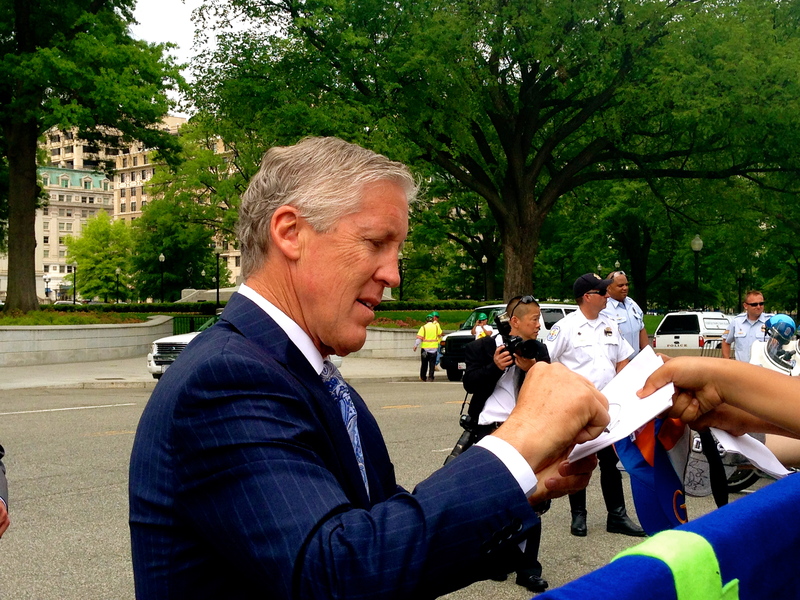 Pete Carroll came right out and shook my hand first and then signed for everyone for several minutes, it was great to see the team! Another day, we took the Metro out to Arlington National Cemetery. This is one of those hallowed grounds that we have all seen dozens of pictures of over the years, but it is much larger that I had anticipated. Here lay the remains of over 400,000 people, all with some affiliation to the military. Our first stop was to the gravesite of President John F. Kennedy and his family; with the eternal flame burning. We then continued up the hill to the house of General Robert E. Lee. This was his homestead back in the 1800’s and the story we learned was that during the Civil War, they began to lay to rest the Union soldiers just below his homestead, so that the General would not want to reside here following the war. Well as it turns out, he was killed in battle, but the family did not want to remain here after the war, and thus sold it to the US Gov’t and it has evolved into one of the most significant burial sites in America today. We then made our way across the ridge of the cemetery to witness the changing of the guard at the Tomb of the Unknown Soldier; a memorial to all those who have served our country, and not returned or been identified. Every 30 minutes there is a ceremony as this memorial is guarded day and night by the Marines Corps; a precisely executed transition, from one Sentinel to the next, to maintain watch over their fallen comrade that is enshrined in the memorial. 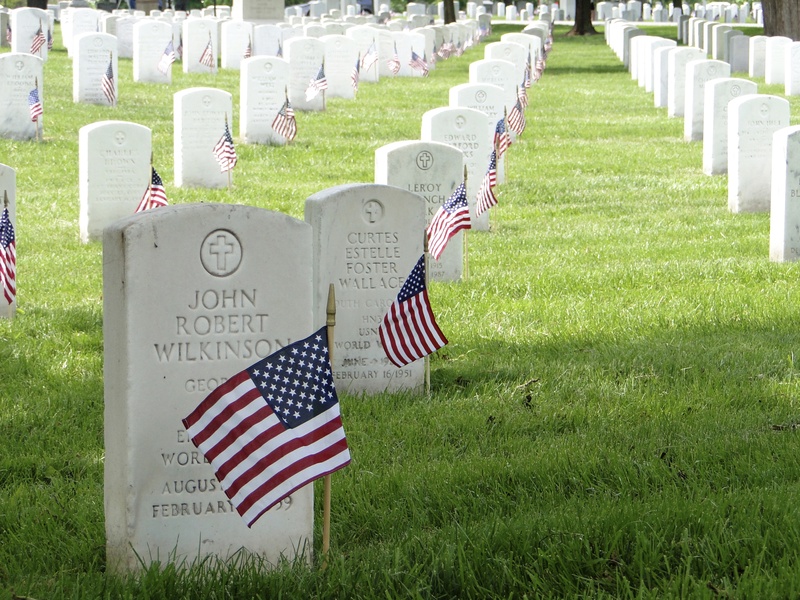 As our visit here ended, we were fortunate enough to witness the dozens of army personnel placing flags in front of each and every head stone. As it was Memorial Day Weekend, and a ceremony was to be held on Monday, they were getting the grounds ready for thousands of visitors. 400,000 small US flags precisely placed the exact same distance from each headstone made for a very powerful ending to our visit. 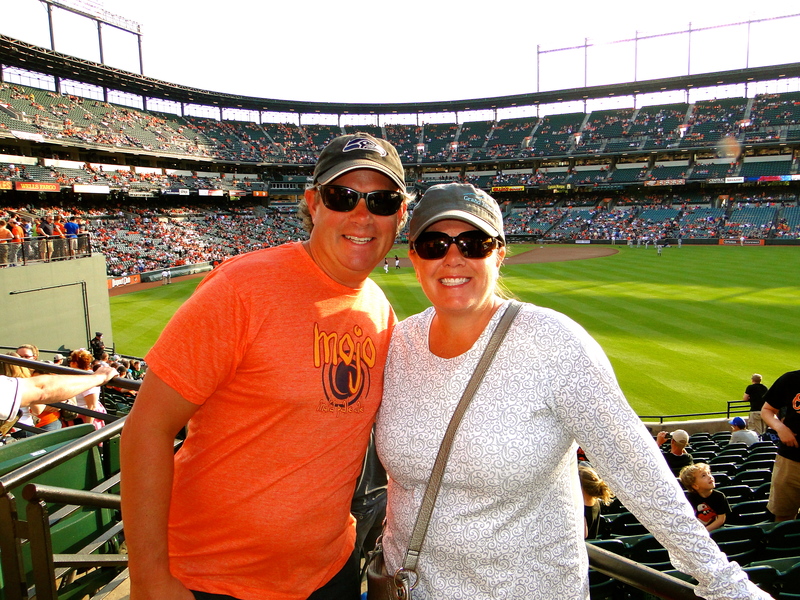 We took one day to make a side trip up to Baltimore, only about 30 miles from our MoHo park. We arrived in the early afternoon to a beautiful 75-degree day, and stopped in the visitor’s center to get our local maps. We were greeted by a nice little old man who gave us the lay of the land and mentioned a couple places we needed to see while we were there. The Inner Harbor area of Baltimore is beautiful, we both were very surprised by how much was going on, and how much there was to do. Tons of restaurant’s, shops, water taxi’s and a variety of historic boats lining the docks. We walked to another area on the harbor, Fell Point, a neat little neighborhood just a mile or so out of the main harbor area and had a beverage at one of the local watering holes recommended by our visitor center gentleman, then returned via water taxi to the main part of the harbor. This was a very vibrant area with lots of people walking around, many getting ready for the Orioles baseball game that night. Traci and I also were headed that way (thanks again Matt for the tickets!) and we eventually arrived outside the stadium and took in the atmosphere. The home team won easily, a nice 8-4 victory over Cleveland. A perfect day and visit to an area we both really enjoyed, a return trip to this area is a must at some point. 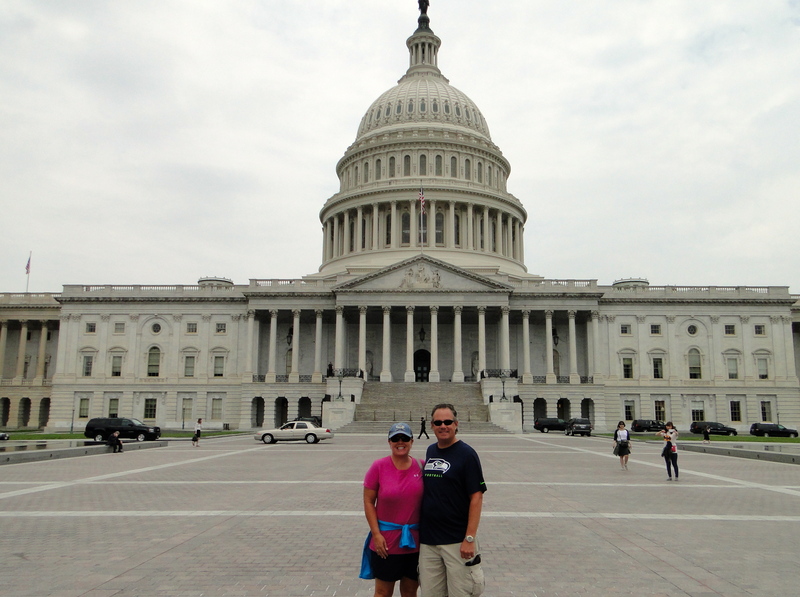 We also visited Annapolis, a tiny little town known for the US Naval Academy that is there. The grounds of the Naval facility are beautiful, with a very significant sports presence, lot of fields, tracks, and all sports related types of areas. It is also where many of the students come to learn how to sail, and there are dozens of training boats on property to use in and around the area. After walking the grounds, we headed into the harbor area of town. Wow, what a neat little place! There were several little restaurants, shops, bars and tons of people out enjoying the day. It was graduation weekend, so it was pretty crowded. It was like this little place was just dropped in here some 200 years ago, and had not changed that much. Narrow streets, with beautiful architectural buildings, and we just loved the vibe here, again a pleasant surprise. 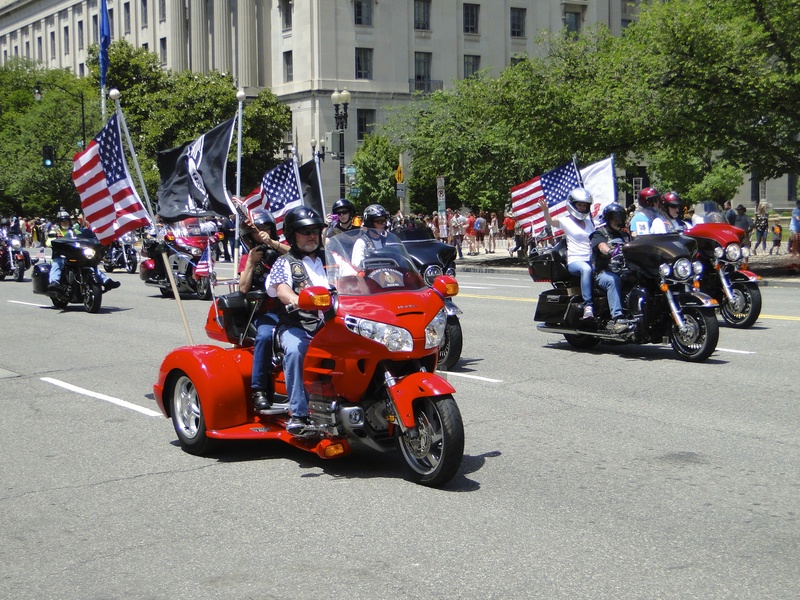 Another event that I had heard of but did not know much about was the Rolling Thunder motorcycle parade held on the Sunday prior to Memorial Day Monday. The bikers congregated at the Pentagon parking lots at 7:00AM, and at about noon they started their ride around the main road of the Mall area and past the Capitol. This ride started back in 1988 to bring to light the POW/MIA movement that was still getting very little traction in the media and public opinion. That first year, there were about 2,500 bikers, with their loud pipes cruising through the area and heard from blocks away. This year there were an anticipated 500,000 bikers, half a million! We were able to find a spot on Constitution Ave. and take in the bikers as they drove by; we stood there for 90 minutes watching and waving at them all. Their message was clear, do not forget those that are missing or lost serving their country, and it was very powerful to see. We finally got hot and hungry, and left the street, but the parade continued for at least 3-4 more hours, and no they were not doing laps, it just takes that long for them all to drive to route, 4 or 5 wide down the street. Our last day in DC, we went down to Mt Vernon and toured General/ President George Washington’s home and estate. A huge area of some 200 acres (originally over 8,000 acres). It is now maintained by a group originally founded back in the mid 1800’s that raised $200,000 back then to purchase and preserve the property. 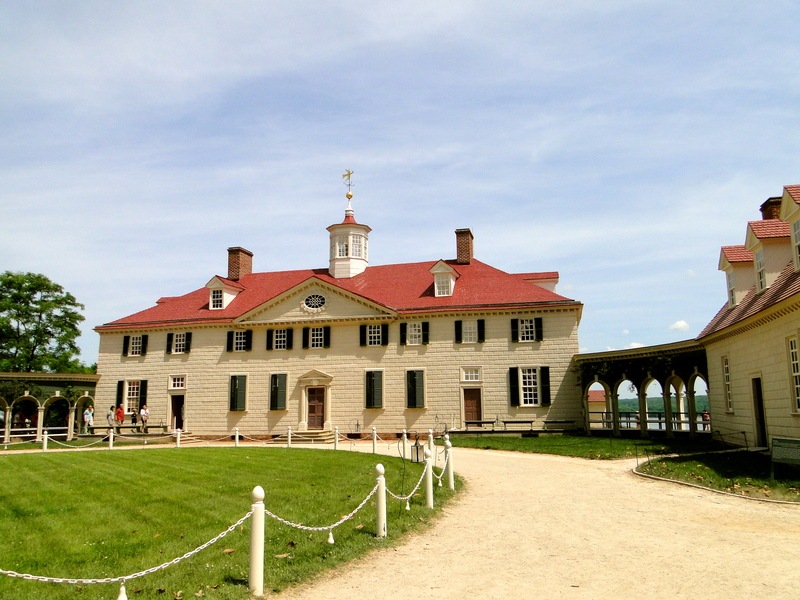 With beautiful gardens, and an amazing view overlooking the Potomac River, Washington had a pretty awesome home, some 250+ years ago. After this we decided to head to the Iwo Jima US Marine Corps Memorial, located across the Potomac from DC, and right next to Arlington National Cemetery. 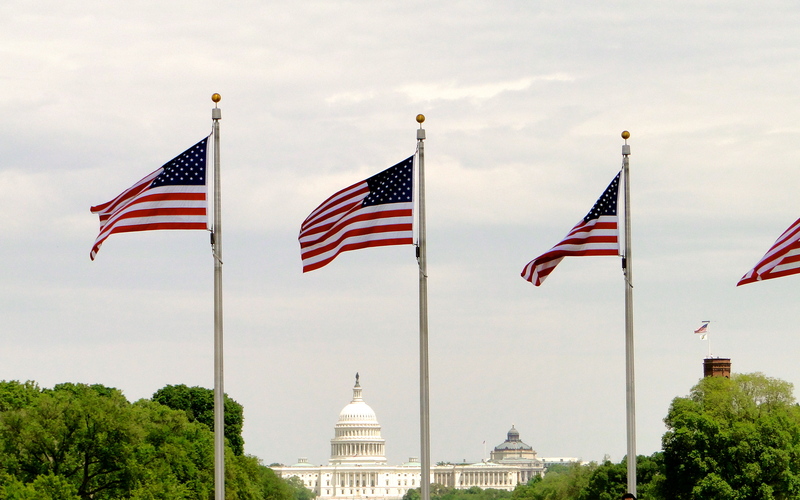 It was Monday, Memorial Day, and it was a perfect ending to our visit to DC. 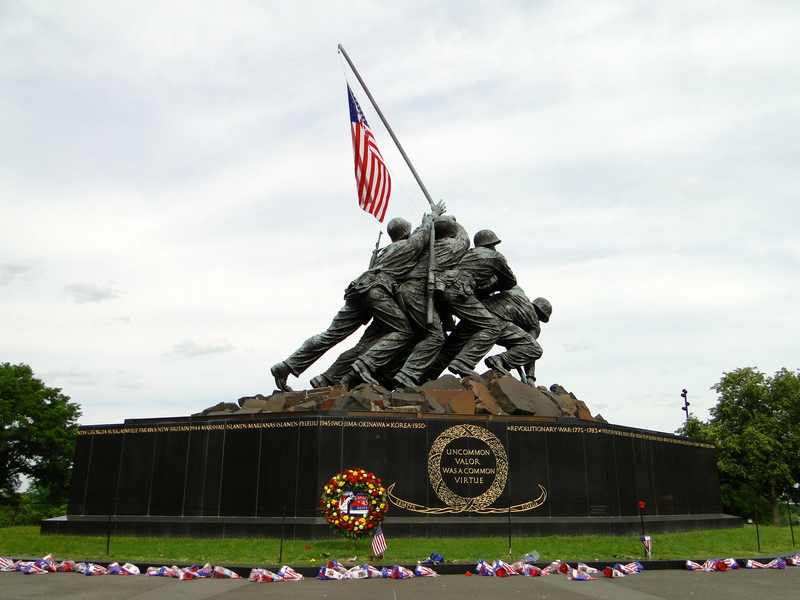 Everyone knows this massive statue, depicting the Marines erecting a flag on top of a hill at Iwo Jima. We were both struck by how large it was, standing some 32 feet off the base of the monument, with a huge American flag waving, it was an amazing site to end our trip on! Rooftop bar in the Washington W Hotel – a great view of the city and looking down on the White House. Founding Farmers – close to the White House. We had breakfast here one morning and it was fantastic! Traci had Stuffed Banana’s Foster French Toast and she said it was her best breakfast ever. Mama Lucia’s – a strip mall Italian joint in College Park right by our MoHo campground. Awesome lasagna and inexpensive! Dock Street Bar & Grill in Annapolis – excellent food and great atmosphere right in the main part of town. This stop will go down as one of our favorites, and we were so lucky to have great weather, get some great recommendations from friends (Thanks Dave Albrecht), hook up for dinner with a childhood classmate and her family one night (Thanks for hosting us Liz and Steve! 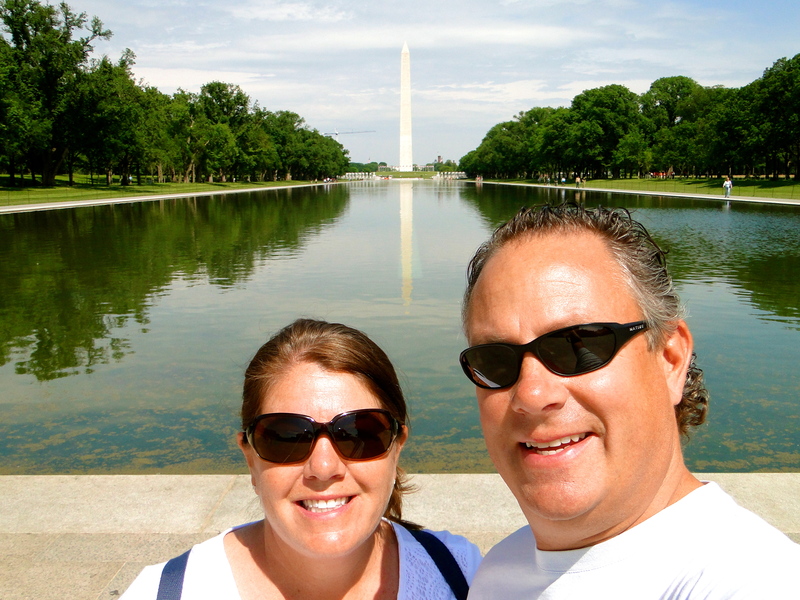 ), and taking in all that we could have imagined in DC! 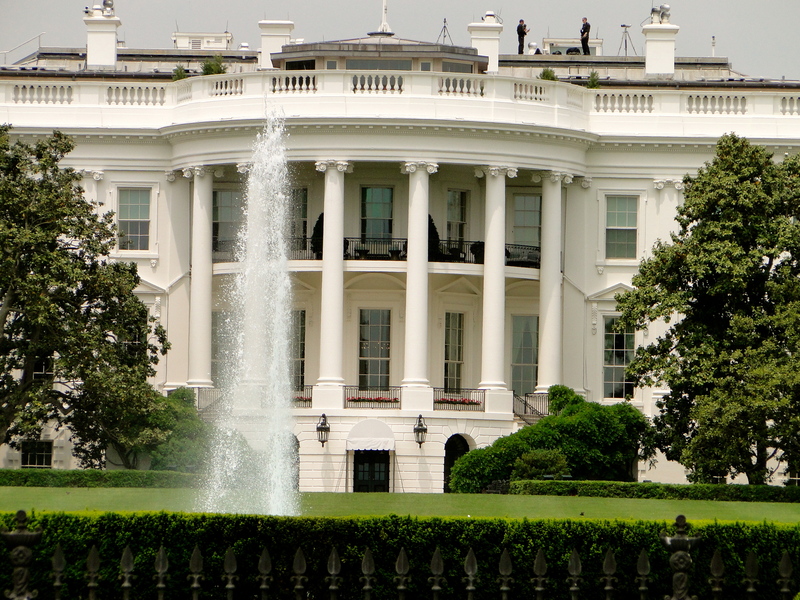 I would highly recommend a visit to our Nation’s capital if you have never been. It is a MUST! 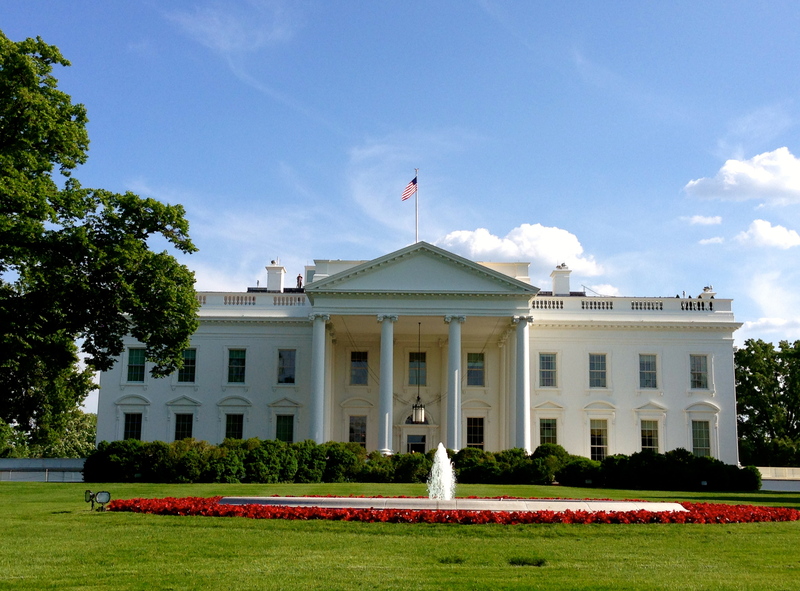 This entry was posted in May 2014 and tagged Annapolis, Arlington National Cemetery, Baltimore, Capitol, Founding Farmers, Iwo JIma, Memorial Day, Rolling Thunder, Seahawks, Washington DC, Washington Monument, White House on May 28, 2014 by Mike.